Salinas is the county seat and the largest municipality of Monterey County, California. Salinas is located 10 miles (16 km) east-southeast of the mouth of the Salinas River, at an elevation of about 52 feet (16 m) above sea level. The most current estimate from the California Department of Finance sets the 2006 population at about 148,350, showing a small decline since the year 2000. The mostly suburban city is located at the mouth of the Salinas Valley roughly eight miles from the Pacific Ocean and enjoys a mild climate. The city consists mostly of late 20th century single family homes, some low-level apartment, ranging from modest bungalows to spacious luxury homes. The climate is also ideal for the floral industry and grape vineyards planted by world-famous vintners. 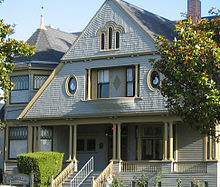 Salinas is known for being an agricultural center and also for being the hometown of the noted writer and Nobel Prize in Literature laureate John Steinbeck, who based several of his novels here. First Mayors House circa 1868 Salinas, CA. The land currently occupied the City of Salinas was historically settled by native Americans known as the Ensen, a subgroup of the Rain Dancers. Large Spanish land grants for the Catholic Missions and as bonuses to soldiers gave way to Mexican land grants for smaller ranchos where mostly cattle were grazed, and a thriving trade in cattle hide came through the Port of Monterey. The Salinas post office opened in 1854. A traveler’s inn called the Halfway House at the intersection of two stage coach routes was built in 1856 and a settlement grew up there. The streets of Salinas were laid out in 1867, and the town was incorporated in 1874. The city was named after the word for a “salt marsh” in Spanish, salinas. Sargent House Historic Victorian Home on Central Avenue Salinas, CA. The economy of Salinas is largely based on agriculture. Located in one of California’s richest farming regions, the area produces a variety of fruits and vegetables, including lettuce, many major vegetable producers are headquartered in Salinas. The historic prevalence of row crops is documented by aerial photographic interpretation of Earth Metrics, Aerial photographic interpretation which study also indicated a major conversion of cropland to urban uses over the time period 1956 to 1968, with that trend continuing for the next decades as well. According to the United States Census Bureau, the city has a total area of 22.8 square miles (52.5 km²), all of it land. The city rests about 18 meters (59 ft) above sea level, and it is located roughly eight miles from the Pacific Ocean, as the crow flies. The Gabilan and Santa Lucia mountain ranges border the Salinas Valley to the east and to the west, respectively. Both mountain ranges and the Salinas Valley run approximately 90 miles (145 km) south-east from Salinas towards King City. The Salinas River runs the length of the Salinas Valley and empties into the Pacific Ocean at the center of the Monterey Bay. It is one of only 30 in the world that flows from the south to the north. During the summer months the river flows partially underground and it this extensive underground aquifer that allows for irrigation of cropland in an area without much annual rainfall. Map of income distribution in Salinas. The population density was 7,948.4 per square mile (3,068.1/km²). There were 39,659 housing units at an average density of 2,086.8/sq mi (805.5/km²). The racial makeup of the city was 64.1% Hispanic or Latino of any race, 45.2% White, 6.2% Asian American, 3.3% African American, 1.3% Native American, 38.7% from other races, and 5.1% from two or more races. 49.2% have children under the age of 18 living with them, 57.6% were married couples living together, 14.8% had a female householder with no husband present, and 21.6% were non-families. 17.1% of all households were made up of individuals and 6.5% had someone living alone who was 65 years of age or older. The average household size was 3.69 and the average family size was 4.08. Median household income in the city tended to be significantly higher alongside the city limits, especially in the northern Harden Ranch and Creekbridge neighborhoods. East Salinas and the downtown area suffered from a very low median household income as well as high crime rates. South and North Salinas featured roughly the same level of median households income with the latter being home to city’s wealthiest newly constructed neighborhoods. Salinas is known as the Salad Bowl of America or Salad Bowl of the World. Over 80% of the lettuce grown in the United States is grown in the Salinas Valley. The city’s labor force is 54.6% blue collar and 45.4% white collar. According to the 2000 US Census, 24% of the population worked in sales and office occupations, 21.4% worked in management, professional, and related occupations, 16.2% worked in service occupations, 14.9% worked in farming, fishing, and forestry occupations, 14.4% worked in production, transportation, and material moving occupations, and 9.1% worked in construction, extraction, and maintenance occupations. Many believe these numbers are skewed as they do not include a significant portion of farm workers and blue collar workers who are migratory and undocumented, and are present for approximately 9 months of the year. On March 10, 2006, a record breaking storm covered many of the nearby mountain tops in a white blanket of snow. Snow in the city of Salinas is extremely rare. Salinas has cool and moderate temperatures, due to the “natural air conditioner” that conveys ocean air and fog from the Monterey Bay to Salinas, while towns to the north and south of Salinas experience hotter summers, as mountains block the ocean air. Thus, Salinas weather is closer to that of the Central Coast of California, rather than that of inland valleys, and thus enjoys a mild Mediterranean climate with typical daily highs ranging from around 52 °F (11 °C) in the winter to around 72 °F (22 °C) in the summer. According to the Weather channel, monthly average temperature highs range from 63 to 75 F.
The average annual rainfall for the city is approximately 14.4 inches (370 mm). Occasionally, there is snowfall on the peaks of the Gabilan and Santa Lucia mountain ranges, but snow in the city itself is extremely rare, occurring about once every 10 to 20 years on average. Salinas boasts an emerging arts scene led by the First Fridays Art Walk and the innovative use of non-traditional or business venues to exhibit art and host live local music. The oldest gallery in Salinas, the Valley Art Gallery, has been active for over 30 years. The Hartnell College Gallery hosts world-class exhibitions of art during the school year. The National Steinbeck Center has two galleries with changing exhibits, and the city’s newest @Risk Gallery features cutting-edge and visionary exhibitions. The Art Walk, held in the downtown area, features 50 venues. Live theater companies in Salinas include ARIEL Theatrical located in the Wilson’s Children’s Theater in Oldtown Salinas, and the Western Stage, a professional company who performs in the Hartnell College Performing Arts Center. Live local music is available at many restaurants in the downtown area, and during the First Fridays Art Walk. Concerts are held at the historic Fox California Theater, Sherwood Hall and the Salinas Sports Complex, as well as at Hartnell Community College. Art Deco Style Amtrak Train Station in Salinas. Greyhound operates a bus station on West Gabilan Street in downtown Salinas with service to other California cities and throughout the United States. Salinas has seven school districts serving the city core and adjacent unincorporated areas. The largest school district in Salinas is the Salinas Union High School District (grades 7-12) with 13,578 students enrolled in 10 campuses. The Salinas City Elementary School District is the largest elementary school district in Salinas, with 12 schools and 7,954 students. Other districts include Santa Rita Union Elementary School District, Graves Elementary School District, Washington Union School District, Lagunita School District, and Alisal Union School District. Opportunities for higher education in Salinas include Hartnell Community College. The Salinas Valley Memorial Hospital and Natividad Medical Center are both located in Salinas. Authentic Wells Fargo Coach at California Rodeo Salinas Heritage Museum. Salinas is a major stop on the professional rodeo circuit. The California Rodeo Salinas began in 1911 as a Wild West Show on the site of the old race track ground, now the Salinas Sports Complex. Every third week of July is Big Week, when cowboys and fans come for the traditional rodeo competitions, including bull riding. Rodeo-related events held in Salinas and Monterey include cowboy poetry, wine tasting, a carnival, barbecues and a gala cowboy ball. Local newspapers include The Salinas Californian and Monterey County Herald. Television service for the community comes from the Monterey-Salinas-Santa Cruz designated market area (DMA). Brendon Small, Actor, composer, and musician. He is best known as the creator of the animated series Home Movies and Metalocalypse. The Kris Kristofferson song Me and Bobby McGee, popularly sung by Janis Joplin, refers to losing Bobby “somewhere near Salinas”, although it’s often misheard as “somewhere miscellaneous”. Salinas is mentioned in various John Steinbeck novels, and it is the setting of his monumental novel East of Eden. James Dean was en route to a car race in Salinas when he was killed in an automobile accident near Paso Robles, California. The Beach Boys mention Salinas in their song “California Saga: California” on their album, Holland. Rancid mentions Salinas in their song “St. Mary” (She took the Greyhound into Salinas . . . ) on the “Lets Go” LP.